KAREN GIBSON ROC, CJ SAILPLANE, DIGBY JONES, Mr. SCRUFF, DEE C&apos;RELL Feat. AUDUN WAAGE & RICHELLE CLAIBORNE and more. 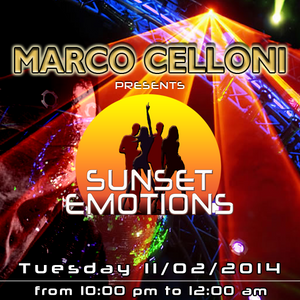 SUNSET EMOTIONS, the side of the lounge and chillout music world of BAR CANALE ITALIA, weekly radio show.